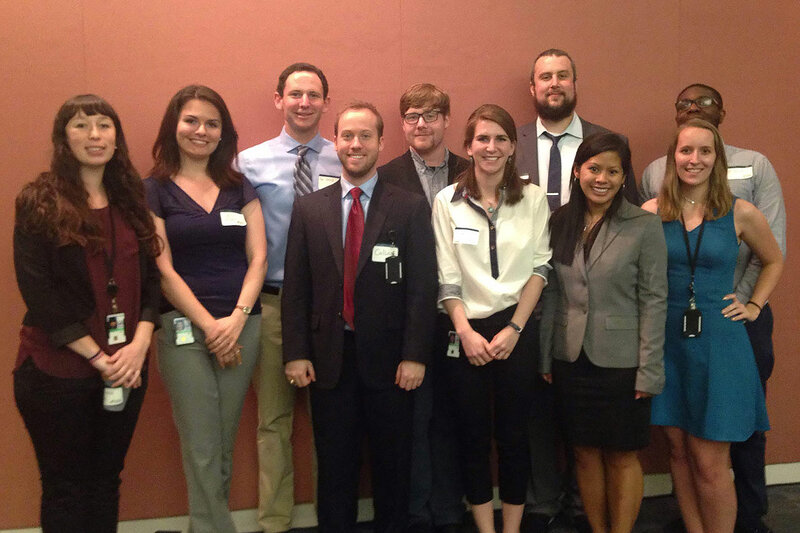 Ten NIEHS postbaccalaureate (postbac) Intramural Research Training Award (IRTA) fellows presented their research April 20 at the National Institutes of Health (NIH) in Bethesda, Maryland, joining more than 600 postbacs for the 2016 NIH Postbac Poster Day at the Natcher Conference Center. Four NIEHS fellows received travel awards from the NIH Office of Intramural Training and Education (OITE) to attend the event — David Banks, Samantha Hall, Miranda Lyons-Cohen, and Emily Mesev. 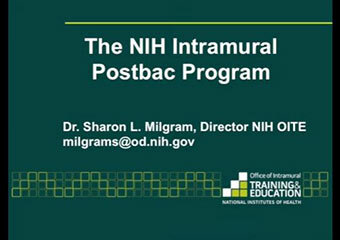 The NIH Postbac IRTA program program allows recent college graduates to spend up to two years conducting full-time research at NIH before applying to graduate or professional school. More than 1,000 postbacs work at NIH institutes and centers in Arizona, Maryland, Massachusetts, Michigan, Montana, and North Carolina. 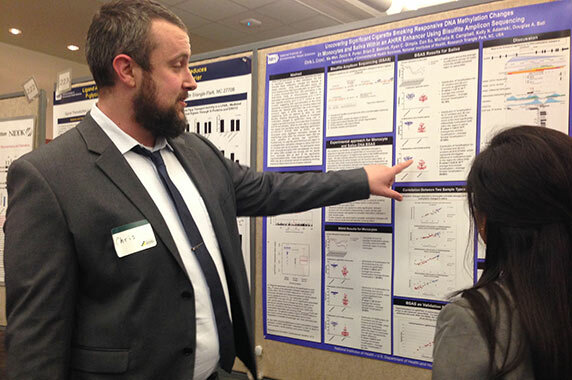 The NIEHS fellows presenting posters at the event are engaged in varied research pursuits across the institute. 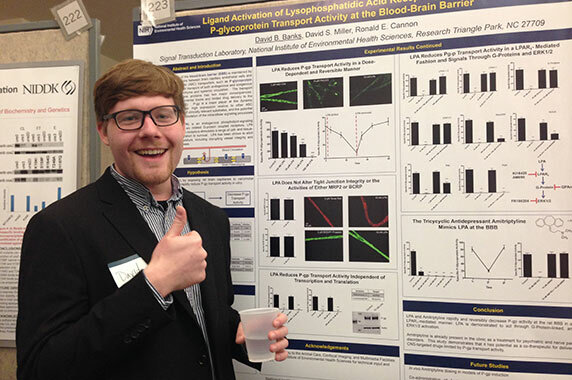 David Banks has studied “Ligand Activation of Lysophosphatidic Acid 1 Receptor Reduces P-glycoprotein Transport Activity at the Blood-Brain Barrier.” He graduated from the University of North Carolina (UNC) at Greensboro and is mentored by Ronald Cannon, Ph.D., and David Miller, Ph.D., in the Intracellular Regulation Group of the Signal Transduction Laboratory. Chris Crowl presented “Uncovering Significant Cigarette Smoking Responsive DNA Methylation Changes in Monocytes and Saliva Within an AHRR Enhancer Using Bisulfite Amplicon Sequencing.” After graduating from the UNC Chapel Hill, he began work in the Environmental Genomics Group led by Doug Bell, Ph.D., in the Genome Integrity and Structural Biology Laboratory. Sagi Enicole Gillera conducted research on “Low Dose Developmental Tetrabromobisphenol-A Exposure: Impact on the Rat Mammary Gland.” A graduate of UNC, she is working with Sue Fenton, Ph.D., head of the Reproductive Endocrinology Group in the National Toxicology Program (NTP) Laboratory. Richard Gilliam, a graduate of Saint Augustine’s University presented an “Analysis of NIEHS Postdoctoral Alumni Career Outcomes.” He was mentored by Tammy Collins, Ph.D., in OFCD during the summer of 2015. Presently, he is mentored by Jean Harry, Ph.D., head of the NTP Neurotoxicology Group. Samantha Hall, from Duke University, researched “Gene Expression Changes Following Repeat Oral Administration of Tetrabromobisphenol A (TBBPA) in Female Wistar Han Rats.” She is a fellow in the National Cancer Institute Center for Cancer Research Laboratory of Toxicology and Toxicokinetics, led by NIEHS and NTP Director Linda Birnbaum, Ph.D.
Collin Johnson studied “Novel Effects of TLR5 in Lung Injury and Therapeutic Implications.” After graduating from the University of Texas at Austin, he began his fellowship mentored by Stavros Garantziotis, M.D., medical director of the NIEHS Clinical Research Unit. Sydney Lierz presented “Evaluating Physiological Roles of ER-alpha Transactivation Domains in Estrogen-mediated Metabolic regulation.” A graduate of North Carolina State University, she is mentored by Ken Korach, Ph.D., head of the Reproductive and Developmental Biology Laboratory and lead researcher in the Receptor Biology Group, and Yukitomo Arao, Ph.D., staff scientist in the group. 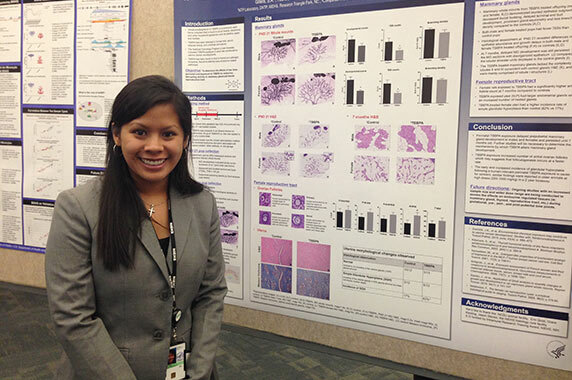 Miranda Lyons-Cohen, a graduate of Reed College in Portland, Oregon, studied “Localization and Trafficking of Pulmonary Dendritic Cells During Early Stages of Airway Inflammation.” She is mentored by Donald Cook, Ph.D., head of the Immunogenetics Group in the Immunity, Inflammation, and Disease Laboratory, and Hideki Nakano, Ph.D., staff scientist in the group. 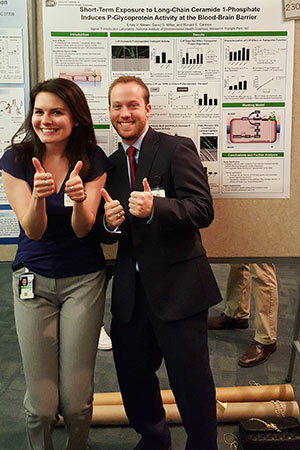 Emily Mesev researched “Short-Term Exposure to Long-Chain Ceramide 1-Phosphate Induces P-Glycoprotein Activity at the Blood-Brain Barrier.” After graduating from Grinnell College in Iowa, she began working with Cannon and Miller in the Intracellular Regulation Group of the Signal Transduction Laboratory. Thomas Neufeld, a graduate of Duke University, presented his research on “Differential Activation of a Mouse Estrogen Receptor Beta Isoform (mERbeta2) with Endocrine-Disrupting Chemicals (EDCs) in an In Vitro Cell Model.” He is mentored by Korach and biologist Yin Li, Ph.D., in the Receptor Biology Group of the Reproductive and Development Biology Laboratory.